I often find myself discussing what the future world will look like. I might wonder out loud what will come after Facebook or Google or whatever. Frequently the response is “nothing”. As in, these companies are so huge that they must simply last forever. Well my quantitative brain simply will not abide by that. Taking to the extreme, I highly doubt Google will still exist in 1,000 years. It might, but I doubt it. There are some companies  which are seriously old, and these seem to be small-ish companies sustained by family tradition. 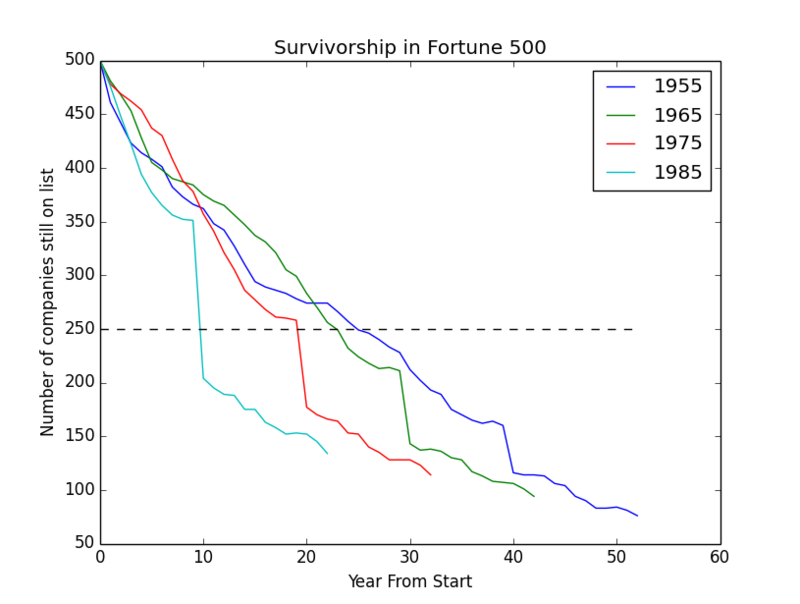 To examine the big company -> last long argument, I went to the Fortune 500 list. Money magazine has data from 1955 . For technical reasons I only examined data from 1955 to 2007. The basic question I was looking at is how long will a company that’s on the list one year stay on the list. That plot, for various starting years, is shown below. These plots are very similar, the second uses an x-axis of relative time instead of absolute so that the different years can be more easily compared. I’m not sure what happened in 1994-1995, so that massive drop might be an artifact or a change in methodology. I should also mention that a firm changing their name, or undergoing a merger, would have the appearance of them disappearing for the purposes of this graph. So this metric is more about the changing of business landscape than whether a company still exists or not. For example, Twitter being bought by Facebook would be much different than Twitter going out of business, but both are much different than Twitter continuing to exist as an independent entity. We see that the “half-life” of companies is about 25 years. A decent amount of time, but still much less than the average lifetime of a human being. Think about that next time somebody complains about big businesses not offering pension plans. 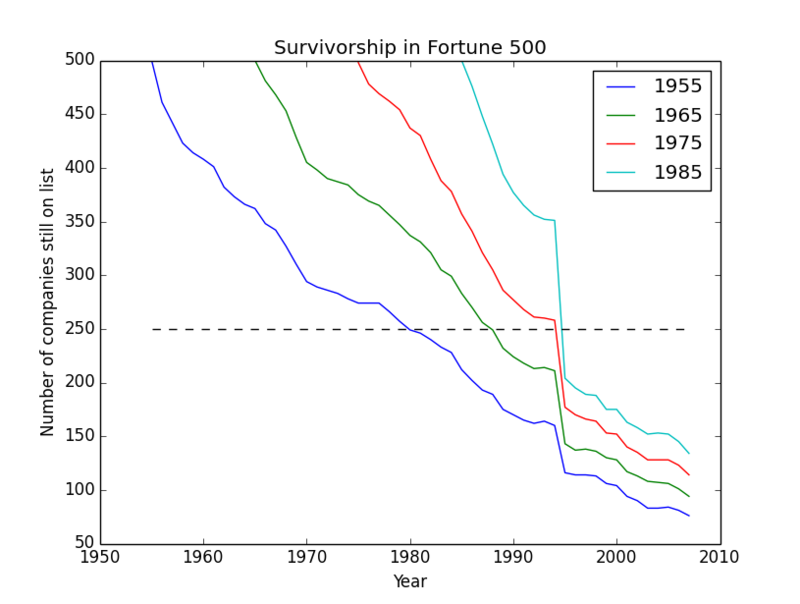 One might expect the larger firms to survive longer. I’m sure this is true, but if GM became the new Kia I think that counts as a big change in the business landscape. This next graph collects the rank of each company in 1955, and organizes them into quintiles, and demonstrates how long those companies remain in at least that quintile. So GM, ranked #1 in 1955, would need to stay in the top 100 (it had a rank of #3 in 2007, so it passed that test). This methodology will slightly advantage those companies with a lower starting rank, as they just need to stay on the list and still have plenty of growth. However, we see that reality has a way of penalizing smaller companies. 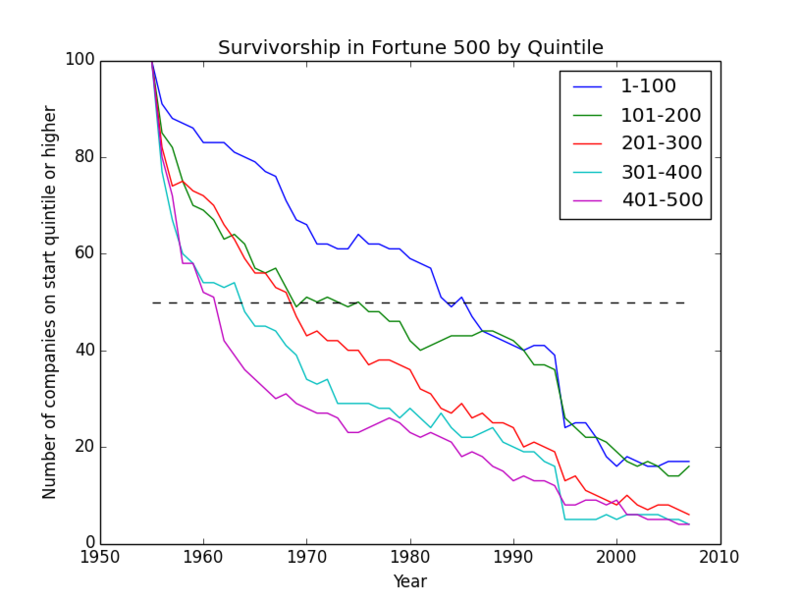 The top quintile has the longest half-life, about 27 years, while the lowest is only 5. Whether this is due to smaller companies being more likely to fail, or simply be acquired, I don’t know. In summary, the market is a harsh mistress. Everybody knows that nothing lasts forever, but forever can be a pretty short time.